What would your clients do if through some inexplicable series of events they found themselves locked in a weight room for an hour? Would they consider it a golden opportunity for an uninterrupted workout or wander aimlessly, gaping in intimidation and confusion at the array of equipment? If their response would likely be the latter, they’re not alone. Especially if their gender or the generation of their youth precluded any exposure to the weight room, clanking metal and grunting weight lifters could be enough to consign them to the aerobics room indefinitely. Women aren’t alone in their weight room discomfort; plenty of men grew up with a preference for books and computers over athletics. Essentially anyone can have little exposure to strength training or not know how to lift weights safely, correctly, or effectively. Weight lifting is best left to body builders and athletes, right? In a word, no. In the ongoing quest for healthy aging and lifelong weight management, strength training is the weapon of choice. 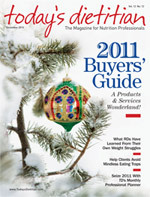 The October Journal of the American Dietetic Association “New in Review” section highlighted three resistance training studies connected to weight management, wellness/prevention, and women’s health, while the August issue of Today’s Dietitian presented an article on strength training as “a fountain of youth”—a small sampling of just how frequently the spotlight shines on strength training these days. Even though it may seem that the good news about strength training is suddenly everywhere, lifting weights to get fit is hardly new. Picking up a set of dumbbells is anything but dumb, and the origin of the term supports just how smart, versatile, and integral this piece of exercise equipment is. Dumbbells were initially an apparatus used for swinging a church bell, back when humans actually performed this task. Since it was the apparatus used to ring the bell vs. the bell itself, it was noiseless, or “dumb.” Ringing the church bell required strength and skill developed through practice, so bars made of metal or wood with a rounded knob at each end were created in pairs to be held and swung for practicing this duty, with the “dumbbells” quickly becoming popular for general conditioning and exercise, according to information on Dictionary.com. While the body of research supporting the health benefits of strength training continues to grow, it’s especially interesting to note how critical resistance exercise is for older adults.2 In fact, the research in favor of strength training is so compelling that it essentially renders senseless any excuse not to participate. But statistics from the Centers for Disease Control and Prevention show that strength training is least prevalent among those aged 65 and older (14.1% among men and 10.7% among women) and the prevalence of strength training among men and women decreases significantly as age increases. Especially between the ages of 30 and 40, many people begin to experience weight gain and age-related changes in body composition. These changes have been associated with a decline in various neural, hormonal, and environmental trophic signals to muscle, leading to a reduction in muscle mass, particularly if people make no attempt to maintain it. Additionally, physical inactivity, hormonal changes, a proinflammatory state, malnutrition, loss of alpha-motor units in the central nervous system, and altered gene expression accelerate the loss of muscle mass and mass-specific strength.5,6 With the onset of muscle loss occurring at such a relatively young age, adding a weight training program sooner rather than later can help individuals get a jump on preserving muscle and a healthy body weight. And a strength training program may not improve only “high-profile” diseases, such as the diseases of aging described previously. For example, sarcopenic obesity—labeled a “geriatric syndrome”5—is a condition in which individuals who are overweight experience a progressive loss of muscle mass, resulting in muscle strength that is too low relative to their body size. Clinician interest in further research to discover treatment and management strategies is high. An encouraging note: Recent research demonstrates that strength training can increase, maintain, or slow loss of skeletal muscle mass, rendering weight training a promising and effective antisarcopenic treatment7 that is inexpensive, noninvasive, and without negative side effects. As clinicians and researchers continue to identify prevention strategies and cures for disease—age related or not—perhaps one of the simplest solutions would be to recommend an hour at the closest gym. 2. American College of Sports Medicine Position Stand. Exercise and physical activity for older adults. Med Sci Sports Exerc. 1998;30(6):992-1008. 3. Ciccolo JT, Carr LJ, Krupel KL, Longval JL. The role of resistance training in the prevention and treatment of chronic disease. Am J Life Med. 2010;4(4):293-308. 4. Phillips SM. Resistance exercise: Good for more than just Grandma and Grandpa’s muscles. Appl Physiol Nutr Metab. 2007;32(6):1198-1205. 5. Stenholm S, Harris TB, Rantanen T, et al. Sarcopenic obesity: Definition, cause and consequences. Curr Opin Clin Nutr Metab Care. 2008;11(6):693-700. 7. Phillips SM, Winett RA. Uncomplicated resistance training and health-related outcomes: Evidence for a public health mandate. Curr Sports Med Rep. 2010;9(4):208-213.